wine-pages.com is a publication dedicated to wine in all its forms. Well, maybe not all its forms. The truth is that mass-market, ubiquitous brands like Blossom Hill or Echo Falls will rarely, if ever, feature here. Wines like these, made in industrial quantities (and seemingly on permanent discount somewhere or other), may be quaffable enough, but I’d struggle to find a story that I’d want to tell about them. Which brings me to Prosecco. I am open-minded about Prosecco, and have reported from extensive tours of the region on at least three occasions, stretching back to my first visit in 2004. There are definitely some quality producers and excellent wines in Prosecco, but I have watched the booming success of ‘brand Prosecco’ with interest. At one level – the level that accounts for the vast majority of bottles popped in bars or stacked on supermarket shelves – Prosecco has become little more than a commodity, made to a crowd-pleasing recipe and designed to be sold cheaply and in vast quantities. The nadir may have been Prosecco offered at £3.33 per bottle in discount supermarkets just before Christmas last year, but £6.99 and £7.99 bottles are easy to find. In my experience, all of it could have come out of one giant, bubbly, off-dry tank. ‘Standard’ Prosecco is not a bad wine, but like most commodity wines, it is not at all distinguished. Trapped in a downward spiral of volume, price competition and discounting, quality must, inevitably, suffer. It also means that many people with a genuine wine passion will not give Prosecco the time of day, confident that Cava, Crémant, and other sparkling wines will deliver more complexity and authenticity for just a few pounds more. So does that matter? True, Prosecco still sells by the boat-load, but its ubiquity, cheap price and phenomenal popularity also creates an image problem. Last year, sales of Prosecco in the UK slowed for the first time since 2011, so could the Prosecco bubble burst? The scenario is maybe not so different to those golden, oak-chipped Chardonnays of the 1990s. Conegliano-Valdobbiadene DOCG is the heartland of Prosecco’s Glera grape variety, where the name ‘Prosecco’ is demoted to small print on the label – or not featured at all. 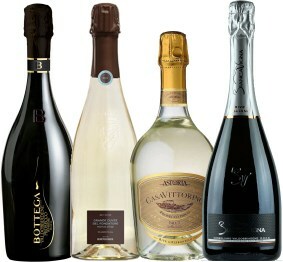 I was recently sent a selection of wines by the producers of Conegliano-Valdobbiadene that promised a different expression of Prosecco, including properly dry Brut and zero-dosage examples (most Prosecco has considerable residual sugar), wines from single vineyards of old vines, and wines grown organically and biodynamically. It was a golden opportunity to see if Prosecco at this level had more to offer. The vineyards around the town of Conegliano are on limestone soils, said to give roundness to the wines, those from around Valdobbiadene on stony soils giving a more chiseled character. Slowly but surely specific sites are gathering a reputation as having a distinctive terroir. 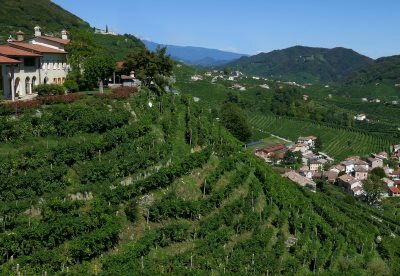 The hill of Cartizze (pictured) in Valdobbiadene is the most established, and most famous of these, where 107 hectares are divided amongst 140 growers, the steep, south-facing slopes lying at between 250- and 300-metres altitude. Most of the bottlings here identify with very specific vineyards or sub-zones, because above all these are – or aim to be – terroir wines that stand apart from more generic Prosecco. Are they successful? Well, as you will see from my notes below, the quality here was generally very high, earning some of the highest scores I have ever given to Prosecco wines. Of course there is variation, with one or two wines that showed the finesse and drier style to elevate them above more mundane examples, but without really breaking the Prosecco mould, whilst others presented something dramatically different and, I have to say, dramatically better in terms of intensity and complexity. There are certainly quality moves in Prosecco, not just in wines like these, but in a growing interest in Col Fondo method wines too. Meaning literally “with sediment,” Col Fondo Prosecco is the revival of a traditional style, with yeast left in the bottle for a second fermentation, unfiltered, unfined and closed with a crown-cap so it pours as a cloudy, dry frizzante wine, very reminiscent of the trendy ‘Pet Nat’ sparkling natural wines. Is it time for wine aficionados to give Prosecco a second chance? Well, the supermarket specials and wines being poured on tap in pubs won’t persuade you, but some of these wines just might. Not only did I find quality here, but enjoyment too, drunk as an aperitif, but also with these drier styles, often a very good match with fish, seafood, sushi and other lighter Oriental cuisines. (2018) This is a very low dosage 'brut nature' with little more than 2g/l of residual sugar, so very, very dry for a Prosecco. It is fairly neutral on the nose, a little apple and fresh pear, but subdued. On the palate it has a very firm acid backbone, perhaps a little too firm, giving a slightly bitter character that is not quite balanced by fruit intensity - or sugar. Armit Wines imports this producer, but does not appear to list this specific cuvée. (2018) There is a lot to like about this premium Prosecco from Ruggeri, another Brut wine with 9g/l of residual sugar, from selected hillside vineyards. It is intense and has a dry mineral character, clear pear and golden delicious apple fruit, and a perfectly balanced, fresh finish. Somehow it did not absolutely distinguish itself in the way some in this tasting did, but it is a clearly superior Prosecco, and gets a wholesome recommendation from me. (2018) All of Bellenda's Proseccos are made with low, or no sulphur, and this Brut example has only 7g/l of residual sugar. It's a finely chiselled, precise style, cool and tempered, subtle biscuit and almond to white fruits, a soft cushion of mousse and a long finish, very nice acidity balancing more of that touch of biscuit richness. (2018) One of the less expensive wines in my premium Prosecco taste-off, and one of my favourites - that was for its sheer zing and zip, with all the Prosecco hallmarks of delicate floral notes and lemon-sherbet freshness and clarity, but with such a surge of flavour and intensity of fruit on the mid-palate, sweetly ripe, yet this is distinctly Brut with 8g/l of residual sugar and a dry, really tangy finish. This is labelled as coming from the slopes of the San Pietro di Barbozza area, and the winery producers various cuvées, like this, from specific terroirs of Prosecco. (2018) This was the stand-out wines of this tasting, not only for its handsome wax-embossed bottle, but for the atyptical intensity of the stuff within. From a single plot (plot #86) of the estate's vineyards lying at 230 metres altitude, there is some skin-contact maceration and a very low 7g/l of residual sugar to make for a more serious style, a frothy mousse revealing white flowers and lemon, yes a touch of icing sugar character, but peaches and salts in a complex picture. In the mouth intense and dry, a charge of electric sour acidity, real mineral saltiness, but softened by the peach down fruit too. So dry, intense yet voluminous, this is the pick of the Prosecco bunch. This vintage is not stocked in the UK at time of review. (2018) Another decidely dry 'Brut' from the hills of Valdobbiadene, I found this to be a particularly estery wine, with notes of banana and peach, and zesty lemon. In the mouth very clean, very precise, still a peachy and slightly tropical fruit quality mid-palate, before cleansing sour apple and citrus acidity gives a pleasingly crisp finish. On offer at £14.75 at time of review. (2018) In some ways it's a surprising Extra Dry, indicating it has more sugar (12-17gl) than a Brut, as the brisk, lean and lemony acidity here gives it a sensation of bone-dryness in the finish. Pretty, floral and icing sugar notes lead on to that palate which, after an initial burst of peachy fruit, soon narrows to a reasonably long and very crisp and agile finish. (2018) A distinctly superior Superiore, from a single, south-facing vineyards in the prime Conegliano / Valdobbiadene zone. Just a few hectares of old vines are reserved exclusively for this cuvée. It is made with a longer maceration on the grape skins before fermentation, to maximise flavours, and is a particularly dry and grown-up style. Floral, lime peel and crunchy apple aromas lead on to a mouth-watering palate, a pithy lemon and grapefruit acidity asserting against the prettier fruit flavours, to give an intensity rarely found in Prosecco, still clear and gossamer-light, into a long, refined finish. Watch the video for food-matching ideas and more information. (2018) Distinctly off-dry with 23g/l of residual sugar, from the famed Hill of Cartizze where Bisol is the largest vineyard owner. Very pale, the bubbles are are tiny and persistent, aromas ultra-delicate, with white flowers, icing-sugar and candied lemon. In the mouth that sweetness is balanced by a rapier core of acidity, fine, incisive, giving real cut to the sherbetty and light peach fruitiness. A very fine Prosecco in such a different style to a wine like the Case Bianche for example. (2018) Only 7,000 bottles were made of this wine from steep, chalky slopes of Cartizze, farmed by the Grotto family for more than 80 years. It is Extra Dry, so with more sugar than a Brut wine, and tastes decidely off-dry after a pear and lemon sherbet nose, delicate hints of white flowers too. The fruit is delightfully sweet, peach-downy and light on the palate, but the core of acidity is very good here, punching through with a pithy citrus dryness to finish.